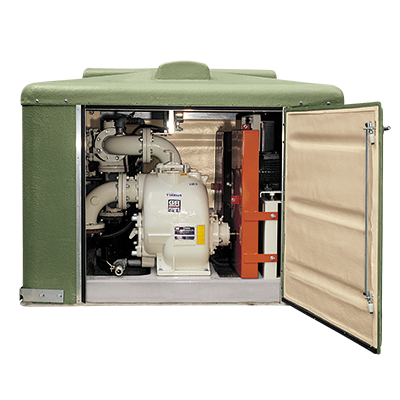 Small but mighty, our most compact sewage pumping station gets the job done. With a neat and trim low-silhouette that blends seamlessly with its surroundings, the only thing that stands out about the ReliaSource® 6x6 Above-Ground Lift Station is its reliable performance. This complete pumping system combines powerful, heavy-duty pumping with quality construction and a host of convenient features to ensure it meets your heavy solids-handling requirements year after year. Like all ReliaSource lift stations, our 6x6 above-ground model is fully customizable, pre-engineered and shipped complete from the factory. Just add power and connect piping for decades of dependable performance.